Assemblyman David Rowlands told TheJournal.ie: “I’m glad they all realise the irony” in a Ukip member seeking EU funds to upgrade the motorway. 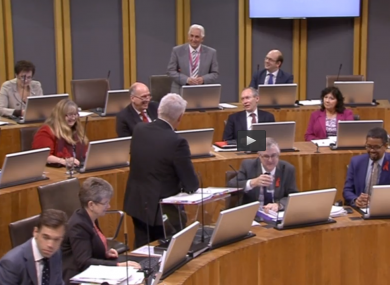 Ukip assembly member David Rowlands asks First Minister Carwyn Jones. UKIP HAS ASKED the Welsh government to seek EU funding from the Irish government to help upgrade a motorway between London and south Wales. The M4 motorway is the main artery between the main cities of Wales and the rest of the UK – but it also carries a large amount of Irish goods exported and sold there. Ukip assembly member David Rowlands made the appeal to the Welsh National Assembly this afternoon. He says that Irish exporters also rely on the M4 to transport goods to other EU countries on the continent – and told TheJournal.ie that it is “quite a reasonable idea to explore”. I kid you not. UKIP AM has just asked if Welsh Govt would ask Ireland to pay for a new M4, because Ireland could access EU funds. Oh yes. Rowlands – one of seven Ukip representatives in the Welsh National Assembly – asked Welsh First Minister Carwyn Jones today to seek Ireland’s help in rebuilding the motorway, using EU transport funds. “First Minister, given that a large proportion of all Irish exports, both to the UK and the EU, pass along the M4 motorway,” Rowlands began – before halting to read the question posed on the order of business. Will the First Minister explore the possibility of part of the costs for the M4 improvement scheme being borne by the Irish government, given that three quarters of all Irish exports to the EU and the UK pass along that road? No, it’s for the Welsh government to maintain the trunk roads and motorways of Wales. I thank the First Minister for the answer, but this is a serious proposition, as I understand Ireland may be able to access European funds from the trans-European highway funds. Although we have been investing a lot in improving transport infrastructure, there is under-investment in many smaller cross-border sections, and bottlenecks. “Of course I’m glad they all realise the irony in what I was saying to the assembly, and they were all intelligent enough to pick it up. “But this is quite a reasonable idea to explore, if you think about it. That bottleneck in Newport is as damaging to the Irish economy as it is to the Welsh or English economy, really. It is a very main access for the Irish economy to get into the UK and Europe, and it must be causing considerable costs to the Irish motor industry and the haulage industry. “In a way, if you think about, Ireland – southern Ireland – is still part of the European Union, and it still desires access to the EU and to the British, the UK markets,” he added. “And if the European Parliament is committed, as they say they are, to having a pan-European highway and networks, they can’t say to Ireland ‘you’re out on a limb now’. So it’s reasonable for the Irish government to say that ‘this is a vital link’. In his reply to Rowlands, First Minister Jones referred to Ukip’s role in Brexit. “The member seems to be urging on me that I should urge the Irish government to apply for European funding for Welsh roads,” he said. He campaigned in June to end European funding for Welsh roads – he can’t now go to another EU member state and ask them to make up the shortfall that he himself campaigned to engineer in the first place. “There’s a second point here as well,” Jones added. “We must be very careful, because England could turn around and say ‘the M4 goes across the Severn Bridge, a lot of traffic Welsh traffic, so therefore we could ask for a Welsh contribution for traffic east of the Severn Bridge’. The French authorities could say that the vast majority of freight that comes from the UK goes through Calais, so the English government should pay for road infrastructure in Calais, and the roads that lead from Calais. The UK is Ireland’s largest European export market by volume and value – although the value of Irish exports to Belgium recently overtook those to Britain alone. Wales recently voted in favour of Brexit, and Ukip won 13% of the recent assembly elections held earlier this year, partly down to their opposition to the EU. Steffan Lewis of Plaid Cymru said to the Assembly today that there does exist scope for a formal bilateral agreement between Wales and Ireland through the Belfast Agreement. “This is a surreal question, even by the standards of this year,” he said. Yet Lewis indicated that there is support for asking for Irish help for Welsh infrastructure. Will the First Minister consider a formal arrangement with the Irish state so we can have future joint working on infrastructure projects – even tapping, dare I say it, into the EU funds? He said such an arrangement could be formalised “into a Celtic Sea alliance so we can give some hope to our western regions, and the eastern regions of the Irish state”. Jones replied: “The Celtic Sea alliance is based, I think, on co-operation between Norway and Sweden, as to how that would work. “It is likely that we will lose indirect funding [after Brexit], as far as Wales is concerned, which will have an effect, particularly on our ferry ports. We’re keen to explore new relationships around the Irish Sea, whether it’s with the Republic, Northern Ireland, the Isle of Man, to see how we can ensure that there is minimal disruption when the UK leaves the EU. Email “UKIP wants the Irish government to help pay for a motorway in Wales with EU funds”. Feedback on “UKIP wants the Irish government to help pay for a motorway in Wales with EU funds”.